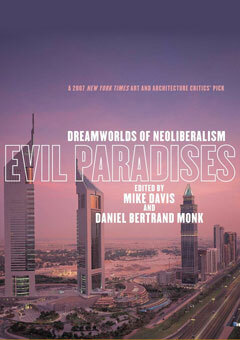 Evil Paradises, edited by Mike Davis and Daniel Bertrand Monk, is a global guidebook to phantasmagoric but real places—alternate realities being constructed as “utopias” in a capitalist era unfettered by unions and state regulation. These developments—in cities, deserts, and in the middle of the sea—are worlds where consumption and inequality surpass our worst nightmares. Although they read like science fiction, the case studies are shockingly real. In Dubai, where child slavery existed until very recently, a gilded archipelago of private islands known as “The World” is literally being added to the ocean. In Medellín and Kabul, drug lords—in many ways textbook capitalists—are redefining conspicuous consumption in fortified palaces. In Hong Kong, Cairo, and even the Iranian desert, burgeoning communities of nouveaux riches have taken shelter in fantasy Californias, complete with Mickey Mouse statues, while their maids sleep in rooftop chicken coops. Meanwhile, Ted Turner rides herd over his bison in 2 million acres of private parkland. Davis and Monk have assembled an extraordinary group of urbanists, architects, historians, and visionary thinkers to reflect upon the trajectory of a civilization whose deepest ethos seems to be to consume all the resources of the earth within a single lifetime. Daniel Bertrand Monk is the director of the Peace Studies Program at Colgate University and the author of An Aesthetic Occupation. He lives in Hamilton, New York.